I hope that Clarence in Paris can become a regular installment here at Keeping the Bear-Garden in the Background. Over the years, I’ve come to regard my burgeoning foodie self as a separate being. This inner fat kid is named Clarence. 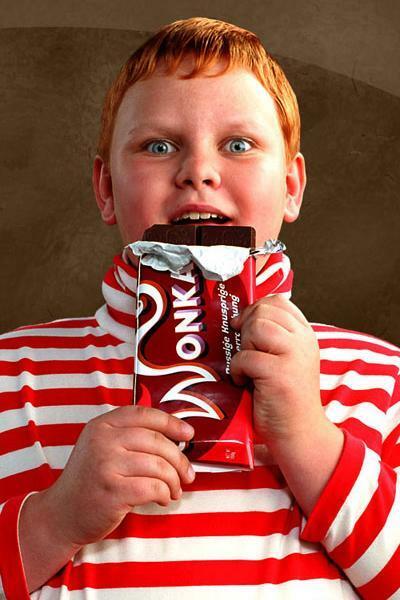 While he is most definitely an American child, he resembles Augustus Gloop. His stained polyester pants are strained at the seams. He likes big buffet brunches, taco trucks, and Korean barbecue. This kid is pure Id, baby. It is in his honor that I inaugurate this series of restaurant reviews. 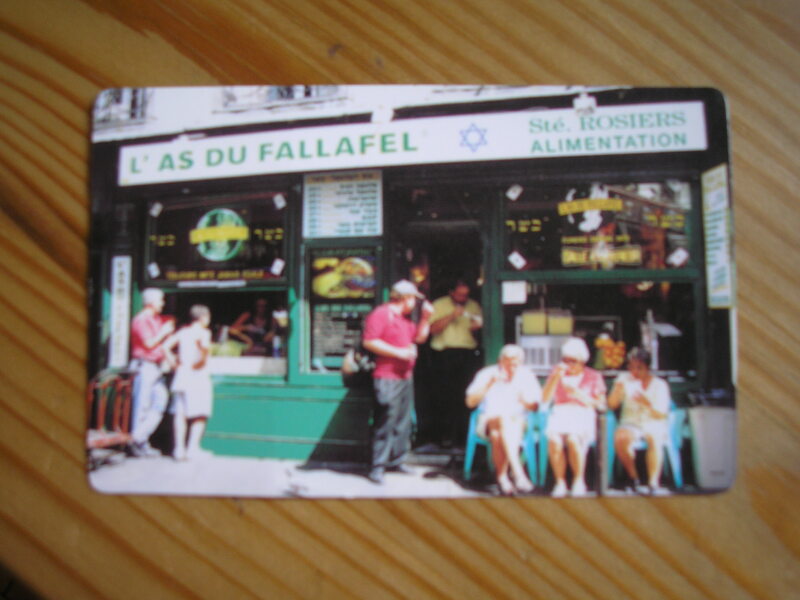 Upon moving to my Marais neighborhood I was informed by many concerned graduate students that while rue des Rosiers was the place to go for falafel, it was important that I go to the right falafel place on rue des Rosiers, lest I want to find myself with stale pita or carrots in my falafel. Nobody seemed to know exactly which falafel place was the right one, so I did like any good detective and trailed a group of drunk American study abroad kids one night. 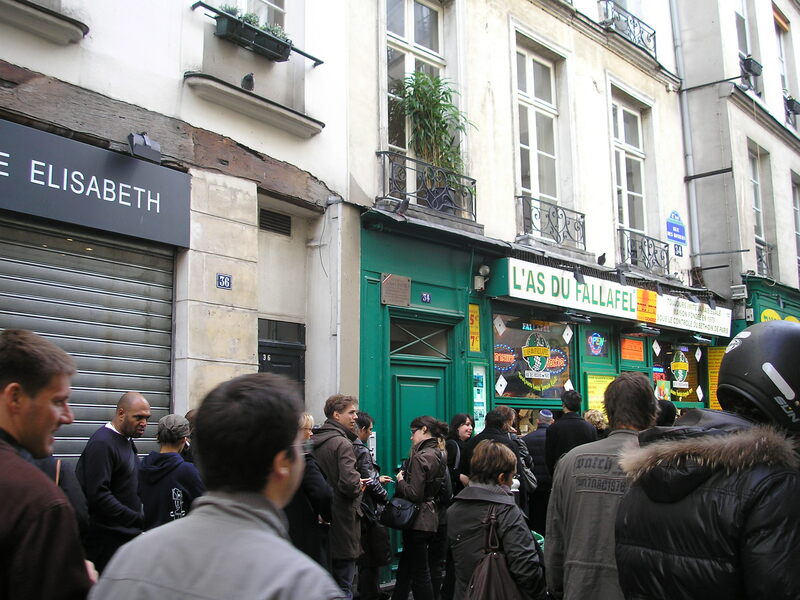 The loudest of the bunch, “Nathan,” claimed to have been subsisting on rue des Rosiers falafel for over two weeks. “Nathan” steered his boisterous clan to L’As du Falafel, where they forked over their parents’s hard-earned cash to one of the two rotating cashier-barkers, both of whom are pretty dreamy if you like a certain type of leather-jacket-wraparound-mirrored-sunglasses-beefy-Israeli-guy (I do). Never had I imagined that I could be so grateful for the guidance of a wasted Wesleyan fratboy, but L’As is most certainly the spot. I marveled at the artistry that is the L’As sandwich construction: hummus smeared all over the inside of the pita, multiple layers of hot falafel, tomatoes, salted cucumbers, white and purple cabbage, and roasted eggplant, all topped off with a hearty dose of tahini and, if you like, “sauce piquante” (harissa, not really all that “piquante” and worth asking for extra). The trick of the L’As sandwich, in addition to the hot-from-the-fryer component, is the layering. None of this business where you eat all the best stuff at the top and then are stuck with a limp pita full of cabbage at the end. The restaurant inside is also quite nice if you like your décor from the Tel Aviv school of kitsch (I do). The basic sandwiches are marked up two euros if you eat inside, a worthwhile investment if (a) if it is too cold to trek all the way down to Place des Vosages with your sandwich, (b) you have a soft spot for Israeli Maccabee beer, or (c) you want to gorge on unlimited harissa from the small jars that reside on every table. The large vegetarian falafel plate is lovely, though I’ll admit to never branching out further on the menu than the namesake dish. I’m vaguely creeped out by L’As’s honesty regarding the mixed-animal constitution (turkey + lamb) of their shawarma. * I don’t know why this bothers me, as I’m a prolific pressed and tubed meat eater. The New York Times says something about L’As’s falafel being so good that even the most dedicated carnivore might flirt with the idea of being a vegetarian. I scoffed when I read that, but it is actually quite true. The catch, especially for the late-night drunken crowd, is that these boys observe the Sabbath, which means that they are closed from dusk on Friday night through Saturday. The upside is that they are open on Sundays, along with every other restaurant in the Marais, which becomes glutted with tourists on the weekends. For those stuck with few options on Christian holidays, I can attest that my mother and I had a lovely Christmas dinner at L’As, chortling about how we probably approximated Jesus’s diet more closely than anyone eating a baked ham. As for the other rue des Rosiers falafel places: in a moment of weakness one Saturday, I made the mistake of trying the falafel from Chez Hanna. I don’t want to slander anybody here, but I would advise you strongly to avoid it. My friend M tells me that the place across from L’As, which makes its money by capitalizing on the long lines at the latter, served her moldy pita bread. I’ll admit to having never tried Chez Marianne, which looks nice enough from a walk-by and has a pretty devoted following. I’m loyal as hell, and my heart belongs to L’As. French language dorks take note: l’as means “ace” or “whiz.” Judging from the logo, I think they are aiming for “The Ace of Falafel,” but I think “The Falafel Whiz” also has a nice ring to it. Details: For 5 euro you get a takeaway falafel sandwich and the smug sense that you are in the know, at least compared to the bewildered Kansans going across the street. Sometimes the line is long, but that’s because it is the best, so don’t be seduced by any of the other falafel barkers on the street. Google is a dirty liar and says L’As is open on Friday night and Saturday during the daytime. It isn’t, nor is it open on any Jewish holidays. * Addendum: For the sake of scientific research, I finally got around to ordering the schwarma sandwich. Skip it. My mouth is watering after reading this post. Perhaps my inner fat kid (Morton) can take Clarence to the Falafel Whiz the next I’m in Paris? I think that sounds like a lovely idea! I’m willing to stand in line right NOW! I see a Lonely Planet entry in your future. . .
We went here today! I hadn’t even seen this food entry yet (I’ve been taking my time diligently reading backward), but clearly we ended up at the right place! I’m glad we all agree that it’s some seriously good falafel. Thanks for the note about “L’As”– My boyfriend and I sat through lunch puzzling over it. Oh, I’m so so glad you made it to L’As — I am finally over my overdose on L’As falafel and craving it again. Enjoy!